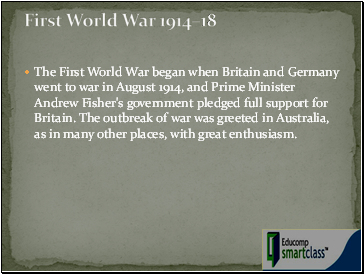 The First World War began when Britain and Germany went to war in August 1914, and Prime Minister Andrew Fisher's government pledged full support for Britain. 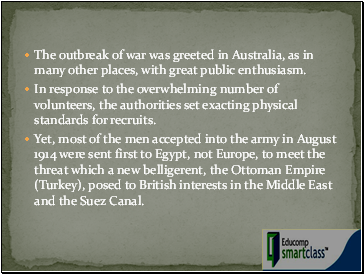 The outbreak of war was greeted in Australia, as in many other places, with great enthusiasm. 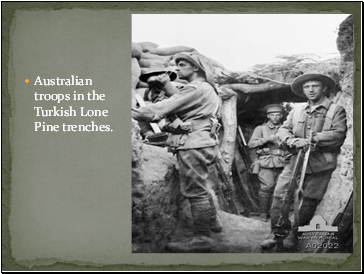 Australian troops in the Turkish Lone Pine trenches. Australia's early involvement in the Great War included the Australian Naval and Military Expeditionary Force landing at Rabaul on 11 September 1914 and taking possession of German New Guinea at Toma on 17 September 1914 and the neighbouring islands of the Bismarck Archipelago in October 1914. 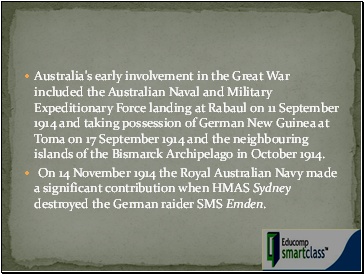 On 14 November 1914 the Royal Australian Navy made a significant contribution when HMAS Sydney destroyed the German raider SMS Emden. On 25 April 1915 members of the Australian Imperial Force (AIF) landed at Gallipoli together with troops from New Zealand, Britain, and France. 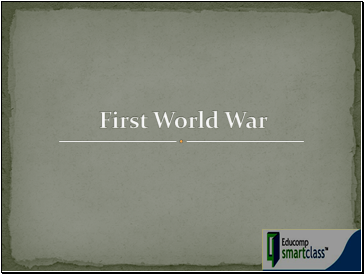 This began a campaign that ended with the evacuation of troops on 19 and 20 December 1915. 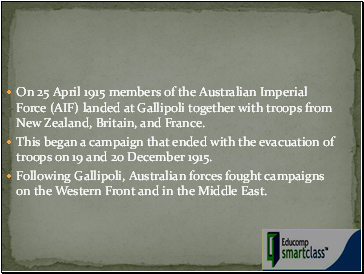 Following Gallipoli, Australian forces fought campaigns on the Western Front and in the Middle East. Throughout 1916 and 1917 losses on the Western Front were heavy and gains were small. 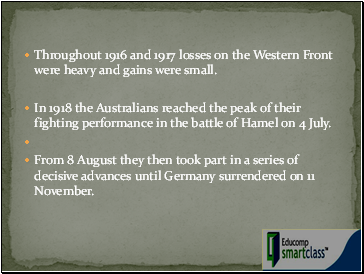 In 1918 the Australians reached the peak of their fighting performance in the battle of Hamel on 4 July. From 8 August they then took part in a series of decisive advances until Germany surrendered on 11 November. 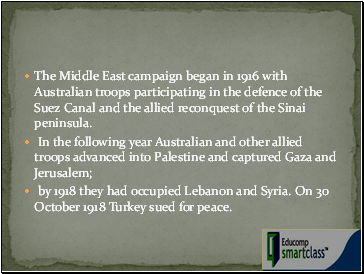 The Middle East campaign began in 1916 with Australian troops participating in the defence of the Suez Canal and the allied reconquest of the Sinai peninsula. by 1918 they had occupied Lebanon and Syria. On 30 October 1918 Turkey sued for peace. 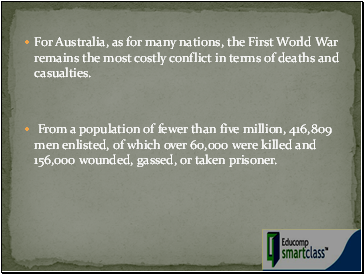 For Australia, as for many nations, the First World War remains the most costly conflict in terms of deaths and casualties. From a population of fewer than five million, 416,809 men enlisted, of which over 60,000 were killed and 156,000 wounded, gassed, or taken prisoner.